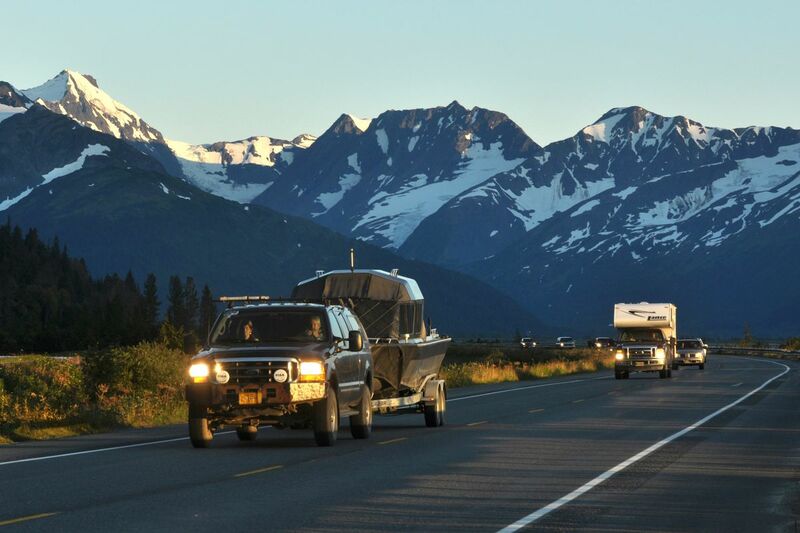 The next series of upgrades for the scenic but accident- and congestion-prone Seward Highway along Turnagain Arm is getting final design touches from state transportation officials as they work on the picturesque segment between Girdwood and the entrance to Turnagain Pass. Called the "Milepost 75 to 90" project, the 15-mile stretch, which includes turnoffs for Portage Glacier and the Alaska Conservation Center, has been eyed by transportation planners for years. Construction is slated to start in 2018 to bring 5 miles of passing lanes to the corridor, among other changes. Engineers recently cleared a big hurdle with the completion of an environmental review. With the Alaska State Troopers largely withdrawn from highway patrols from Turnagain Pass to Anchorage, the Girdwood town supervisor in charge of public safety said improvements are more welcome than ever. The Seward Highway is the only road between Anchorage and the Kenai Peninsula. 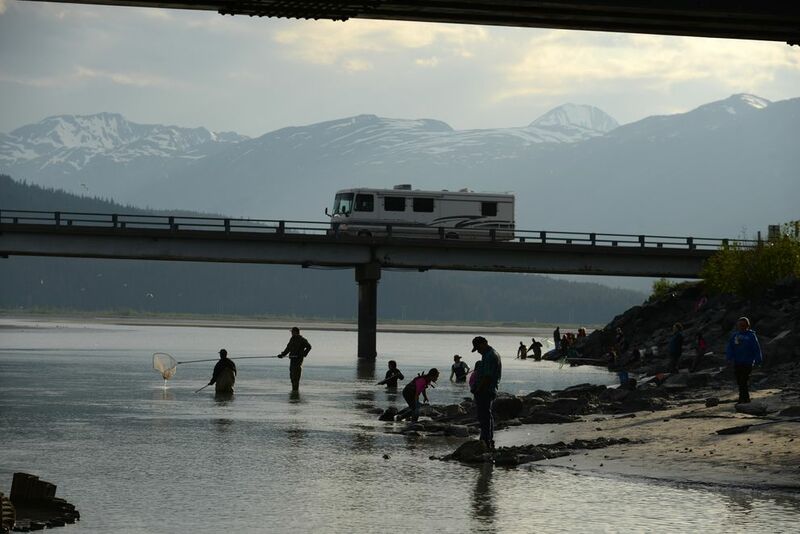 Along the Arm, the winding road, nestled between the mountains and Cook Inlet, is a federal "scenic byway." But it's also designated as a safety corridor because of its high crash rate. The state Department of Transportation and Public Facilities has spent years on a step-by-step approach to making the highway safer. A past vision of a four-lane divided highway – a costly, complex undertaking — has largely been supplanted by smaller projects to expand and add passing lanes to what's often a narrow road with just two lanes. "Between the railroad, the cliffs and the water, it's a very challenging place to make improvements," said DOT spokesperson Shannon McCarthy of the highway along the Arm. "But we have been going systematically." Other projects in the queue include the planned addition of passing lanes to a 6-mile stretch between Bird and Indian, and widening and straightening out the road near "Windy Corner," a popular sheep-viewing area closer to Anchorage that's also known for wrecks. 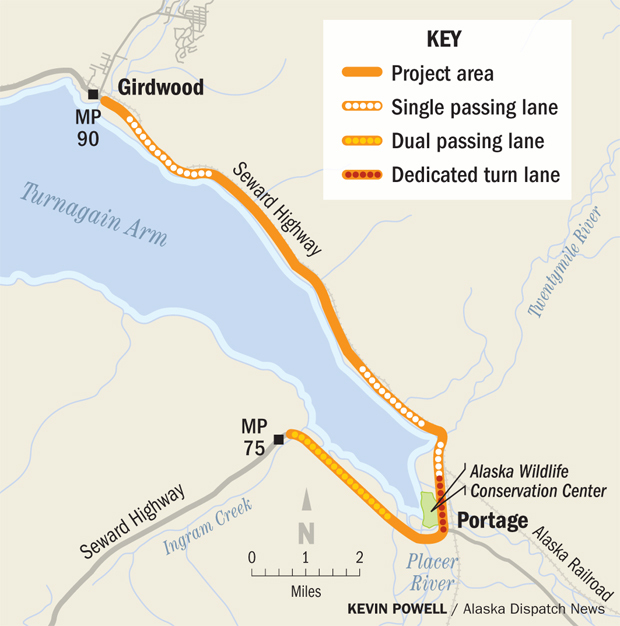 The stretch between Girdwood and the mouth of Turnagain Pass is one of the last in line for upgrades. Transportation planners began exploring improvements to the area more than a decade ago. The project area includes the scenic but sharp bend that passes turnoffs for Portage and the wildlife conservation center. At this point, it's a rural two-lane road with no passing lanes, despite traffic of more than 15,000 cars a day between May and September. Vehicles can back up for miles, leading some frustrated drivers to attempt risky passes, transportation planners say. Between 2000 and 2010, officials recorded more than 330 crashes in the corridor. Six were fatal and 18 had major injuries. In July 2015, a wreck involving a tour bus and six other vehicles at the wildlife center killed one man and critically injured several others, causing a 10-hour traffic jam. On top of congestion and crashes, planners have documented other problems. With no parking lots close to a hooligan fishery near TwentyMile River, cars often park on the shoulder of the highway, causing congestion and safety problems, according to DOT. Dipnetters also park on the shoulders and climb over guardrails to fish in the Arm. Eight bridges are close to failing, and some culverts are corroded enough to be in danger of causing sinkholes. The project calls for those bridges to be replaced, as well as a number of culverts. Two new parking lots will be built on the Arm-side of the highway between Mile 81 and 83 to accommodate fishing traffic. Engineers plan to widen parts of the highway and build in 5 new miles of passing lanes to improve traffic flow. Some curves in the road, including at Mile 88, will be straightened out to give drivers a better line of sight, said Sean Baski, the project manager. There's a hefty price tag for all the improvements — between $200 million and $250 million. Most of the money will come from the federal government, but the state will be responsible for about 10 percent of the cost. Capital funding from the state of Alaska has been scarce since oil prices cratered more than two years ago. But McCarthy said she expected the Legislature to approve the match money in 2018. The Girdwood Board of Supervisors, a limited local governing body within the Anchorage municipality, hasn't taken a formal position on the project. But Sam Daniel, Girdwood's public safety supervisor, said the community generally supports efforts to make the highway safer. "All of us have had some sort of close encounter with people who are trying to turn across traffic" and get into the conservation center, Daniel said. "That's a huge problem there. It definitely needs to be resolved." It's more critical now than ever, he added, because troopers have sharply pulled back highway patrols due to state budget cuts. The project is set to unfold in two phases, with construction slated to start in 2018 and finish in 2022. Officials are taking comments about the project online.